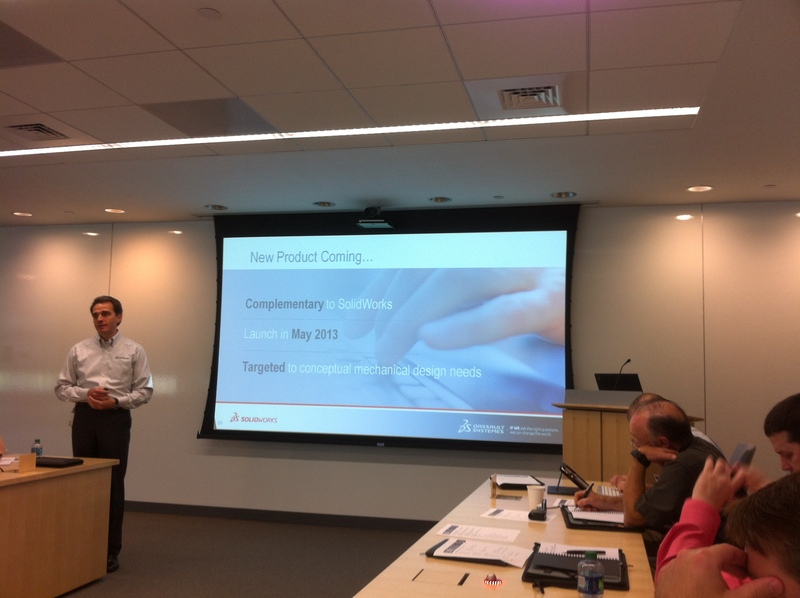 I just spent all day Thursday at the SolidWorks 2013 Press Event in Waltham, MA. The event was held at the newly opened Dassault Systemes North American headquarters. It was an action packed day and there are many things to talk about over the coming weeks. The purpose of this post is to give a quick overview of the events. Wednesday night we gathered at the DS Headquarters building for a clambake and building tour. It was very nice to see many of the folks that I only get to see at these events. The building was quite impressing. There are plenty of open spaces, collaborative spaces, and room for expansion. Many steps were taken to make it as “green” as possible. Everything from water efficient toilets, to automated lighting systems that turn themselves off when not in use. There are no soft drink machines in the building either. There are several soft drink serving machines much like what you would find at at fast food restaurant. (This eliminates thousands of pounds of aluminum per year by not using cans.) In essence, DS is not just talking the Sustainability talk…they are walking the walk as well. Pretty much everyone that was in a DS office in the Boston area has now been relocated to the new office. This will allow further collaboration across all the DS brands. Thursday morning was the kickoff of the press event. All of us were together for the first two hours. 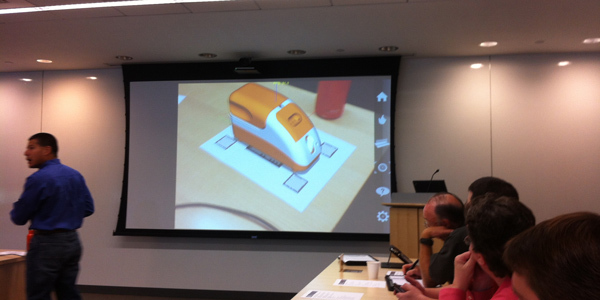 After that, the Bloggers went to a deep dive demo of SolidWorks 2013 while the rest went into more general overview sessions. Bertrand Sicot kicked things off by welcoming everyone and providing some information on the state of the company. I took notice of one of his first couple of slides. It listed the “CEO priorities”. At the top of the list was “Stay focused on the customer”. As a user and customer, it is always good to see that. In fact Bertrand just recently got back from several user group visits with Richard Doyle, so he is certainly getting out in front of customers. Ever since SolidWorks World 2010, folks have been jockeying for information on the “New SolidWorks Platform”, “SolidWorks V6”, “SolidWorks in the Cloud”, or whatever you wish to call it. The following was revealed during Bertrand’s presentation. A New Product is coming. It will be Complimentary to SolidWorks. It will launch in May 2013. It is targeted to conceptual mechanical design needs. Bertrand stressed that it is NOT a replacement of SolidWorks. Below is a screenshot of the slide. OK…now that we have that out of the way…lets get back to SolidWorks 2013. Seats of SolidWorks grew by 13% in the last year. 20% of license revenue are now derived from “non-CAD products”. SolidWorks Plastics: Tools for Plastics Designers AND Mold Designers. Rick Chin demonstrated a really cool Augmented Reality application that uses an eDrawing model on an iPad to display the model through the camera on a table. I’ve seen applications similar to this in my kid’s Nintendo 3DS handhelds. This one of course was way cooler and had more options. The resolution was GREAT and the model could even be sectioned! No mention of a release date, but I have a feeling we’ll see it out sooner rather than later. Below is a picture of Rick using demonstrating the app. UPDATED 9-10-12: I’ve also posted a video (below the image) showing a portion of Rick’s Demo. 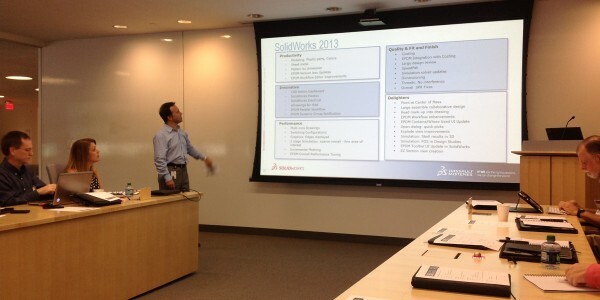 Gian Paolo Bassi was up next to introduce the highlights of SolidWorks 2013. He mainly hit the highlights but offered some interesting insights to the extent in which the developers have been going to improve the user experience in SolidWorks 2013. Details of the actual release will be forthcoming. (Especially when the NDA is lifted on September 10th). Below is an image showing some of the features coming in SolidWorks 2013. Seems, fruitful event! the implication of this will be the best in the field since now, I can expect that, the model is much enduring and interesting!